I got the chance to sit town with an incredible human, Marianne Williamson. When she addressed a group at the SAP Hudson Yards HQ, before our sit down interview, she was poised, had incredible emotional intelligence, as well as realistic about what she was going up against in her candidacy in the 2020 Presidential elections in the United States. The audience included some of the brightest and intelligent people that could represent technology, humanity, academia, science and politics. Her talk was confident, real, and truly inspiring to everyone in attendance. The event was hosted by Kunal Sood and Sidney Nakahodo that serve as the Ambassadors for the New York’s Chapter for Singularity University. Ann Rosenberg generously was the venue sponsor and is currently the SVP of SAP next-gen a purpose driven innovation space. Sood, who is also the Founder and Chairman of X Fellows, Novus and X Impact Group continues to curate extraordinary experiences at iconic locations such as the UNGA, SAP, Google and NASA. 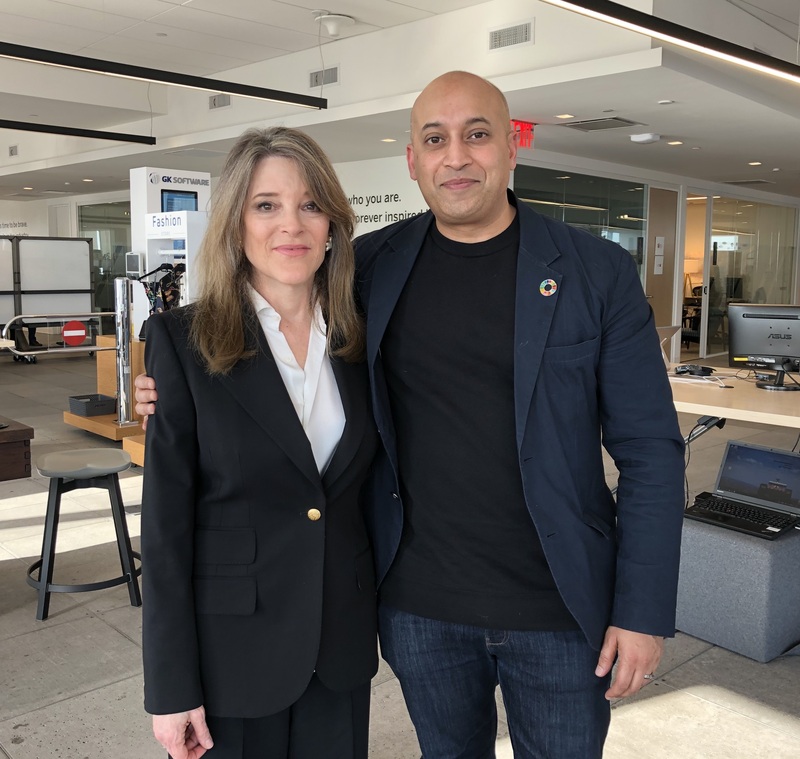 Kunal introduced Marianne to come up and speak and engage the audience with inspiring words as an exponential leader of the future that could be transformational for the nation and world at large. See my exclusive interview with her below.